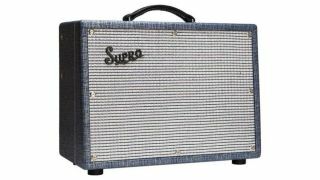 Musician's Friend has announced an absolutely amazing deal on the Supro 1622RT Tremo-Verb. From now until November 25, the 25W 1x10 combo is available for $649, half off its original list price of $1,299. Featuring four 12AX7, one 12AT7 and two 6973 tubes, onboard reverb and tremolo effects, plus a two-band EQ, the 1622RT is a terrific investment for smaller gigs and recording sessions.